Another pattern inspired by cycling? Yes. It was also technically my 50th pattern! I've had two more since then, but clubs throw off linear time cycles. Beginning in 1896, Paris-Roubaix (Pair-ee Roo-bay) is one of the oldest road cycling races still running. The trek always leaves riders caked in mud and grit from the cobbled paths and rutted tracks of northern France's former coal-mining region. The best part? The winner gets to keep a cobblestone as a trophy. With this project, you get a smart set of cuffs and matching cowl inspired by the winding tracks and cobbles of this spring cycling classic. Even though this event is nicknamed l'Enfer du Nord, or Hell of the North, this knitting project is more like freewheeling! Cowl Size: 6.75” long. 20” circumference. Cuff Size: 6.75” long. Circumference depends on preference. 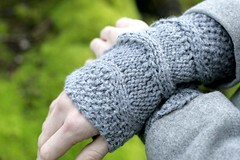 Yarn: Any Heavy worsted-weight or Aran- weight yarn that gives you proper gauge. Sample shown: Berroco Remix [30% Nylon, 27% Cotton, 24% Acrylic, 10% Silk, 9% Linen; 216yd per 100gr ball]; color: 3930 Smoke: 1 ball. A note about the yarn - It's made from 100% recycled fibers and is machine washable. Isn't that cool? Needles: 1 set US #8/4.5mm straight or circular needle (or size to get gauge). Gauge: 18 sts/25 rows = 4" in Stockinette St. Skill level: This advanced-beginner pattern is knit flat and sewn together. 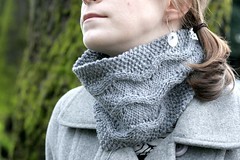 You’ll need to know how to cast on, knit, purl, increase, decrease, and bind off. If you'd rather buy a hard copy of the pattern already printed and ready to roll - head over to Twisted. 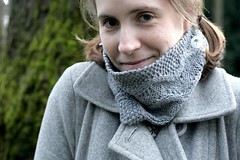 This pattern was test knitted and modeled by Sorren Kerr. Photographs by Vivian Aubrey. Many thanks!